The “archival sphere” and archivists currently exist in a time of challenges and change. The function of archives as storehouses of information is contested by numerous other types of institutions which cultivate memory, offer or curate information; the increasingly ubiquitous use of the word “archive” may be considered a symptom of this. The necessary re-orientation of archives towards the digital has been undertaken; it demands new strategies and expanded knowledge and skills from archivists, without making “traditional” knowledge and skills obsolete. Under conditions of shrinking resource allocation, this situation exacerbates conflicts of aims, necessitating specialisation, the setting of priorities, and above all increased co-operation with other disciplines and institutions. With an eye on these ambient conditions, the goal of the conference is to ask questions about the position of archives in the present, about their importance in the information age, starting with the assumption of a tension between what is and what is wished and aimed for. What roles can and should archives play in the information age, based on the knowledge and skills concentrated in them? Answers to these broad questions will be sought in individual panels dedicated to the key activities and tasks of archivists, as manifestations of their specific knowledge and skills; these will be discussed both in theory and in regard to their practical realisation in daily archival work. 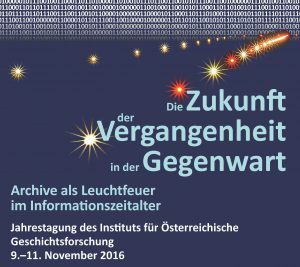 The event is organised by Heinrich Berg (Municipal and Provincial Archives of Vienna), Elisabeth Schöggl-Ernst (Provincial Archives of Styria), Thomas Stockinger (Institute of Austrian Historical Research) and Jakob Wührer (Provincial Archives of Upper Austria). Das conference programme is available here in PDF format. Abstracts of the presentations will be published in this blog in October 2016. The official conference hashtag is #IOeG2016.